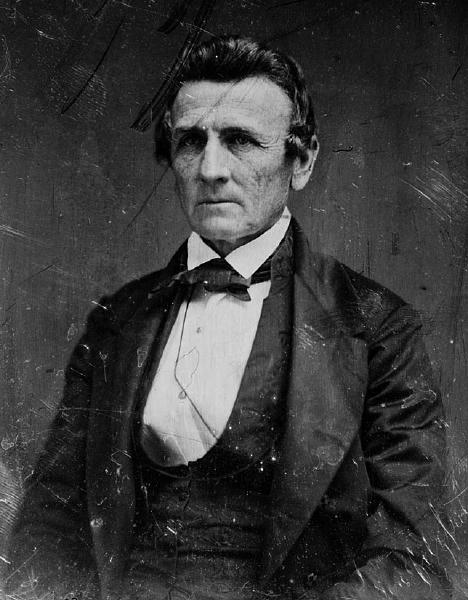 Benjamin Fitzpatrick was born on 30 June 1802 in Greensboro, Greene County, Georgia, orphaned at the age of seven, and raised by an elder sister and brothers. According to the 1878 City Directory and History of Montgomery, Alabama: "The dramatic talent among the early inhabitants was soon developed. In the fall of 1822, a Thespian Society was ortganized that gave its first public performance on the night of the 17th of December, at the 'Montgomery Hotel.' On this occasion, Shakespeare's great tragedy of Julius Caesar was produced with: Julius Caesar, Benjamin Fitzpatrick; Octavius Caesar, G. W. B. Towns; Marcus Antonius, Henry Goldthwaite. . . Of the twenty-three citizens who represented parts in the play. . . [t]hree of them afterwards obtained high distinctions, to wit: Mr. Fitzpatrick became Governor of the State and United Sttes Senator, Mr. Towns, Governor of Georgia, and Mr. Goldthwaite, Chief Justice of the Supreme Court of Alabama. . . ."
He married Sarah Terry Elmore, daughter of John Archer Elmore and Mary Ann Martin, on 19 July 1827 in Wetumpka, Elmore County, Alabama, with J. H. Devotie, MG, officiating. He married Aurelia Rachel Blassingame on 30 November 1846 in Alabama, or 28 November. Benjamin Fitzpatrick died on 21 November 1869 at age 67 in Wetumpka, Elmore County, Alabama.